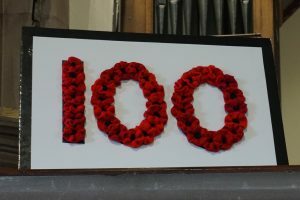 The past week has been very much focussed on the commemorations for the centenary of the end of WW1 and there has been much to do and see locally. 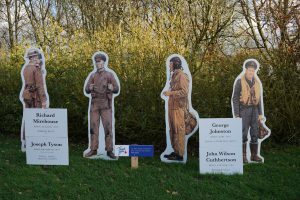 As well as the Remembrance Day services, many local towns and villages had silhouettes and figures as well as poppies in public places and on Sunday evening beacons were lit at Mosser and Lamplugh. 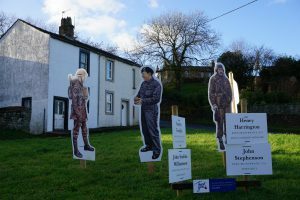 Both Ullock and Branthwaite which are villages I pass through on my way to Workington had WW1 figures on their village greens. 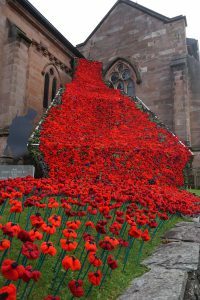 St John’s Church in Keswick created a magnificent cascading display with 1300 knitted poppies. Amazingly they survived all the wind and rain that was thrown at them. Lorton held an Arts Festival with films, talks and an exhibition of ‘Tales from the Valley’ to which I contributed with some postcards sent from my Uncle Will in France to my mother who was ten years old at the time. 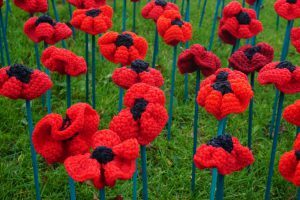 He was in the war from 1914 and sadly died at the end of September 1918. 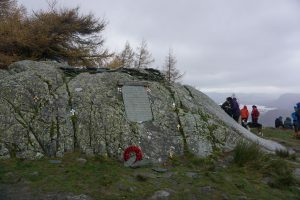 On Remembrance Day itself I joined around 200-300 people on the top of Castle Crag in Borrowdale for their annual service: a moving occasion. 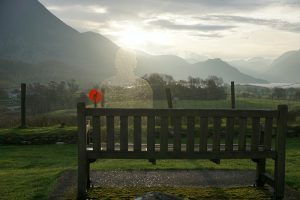 My silhouette on the bench outside Foulsyke? He has a large poppy windmill which whizzes round in the breeze as he gazes towards the fells.